QuickSearch (Primo) is a new way to search multiple sources all at once. Now, instead of going to one place to find books, another place to find journal articles, and yet another place to find videos, you can do a combined search and pull up a variety sources from a variety of places! Where do you start? 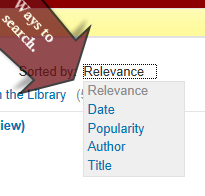 Begin right at our library webpage and use the above search box! By using something called “facets,” you can still filter and refine your results. You can find sources by format (books, articles, videos), by publication date, by author, and even by the publisher. In other words, even though you often pull up a lot, you can still get exactly what you need. You can sort your QuickSearch queries in several different ways: by relevance, by most recently published, by author, by title, even by popularity. What is a popularity search? 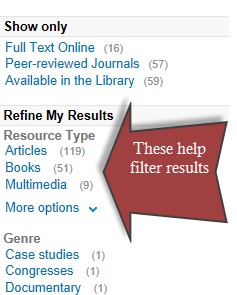 It’s a search where the articles and books that have been used the most by others come up first in your search query. You can search QuickSearch in the same way that you search Google. In the past, you may have been taught that you need to connect keywords by using the word AND. In QuickSearch, you don’t have to do that. Also, like Google, spelling errors won’t always ruin your effort. This doesn’t mean that you shouldn’t think about the keywords that you use, but it does mean that often a misspelled word, won’t stop you from pulling up some great sources. So, check out QuickSearch or get more information here at Quick Search 101: http://library.vccs.edu/reference/primo-faq.html And if you have any questions, comments or great search techniques that you’d like to share, email a Reynolds librarian at library@reynolds.edu.